Drive out of the main gate (there is a second gate allowing access to the causeway crossing done earlier) at Shingwedzi heading towards the main H1-6 and after about 2 kms turn off to the left. This is a short, close to camp, loop. 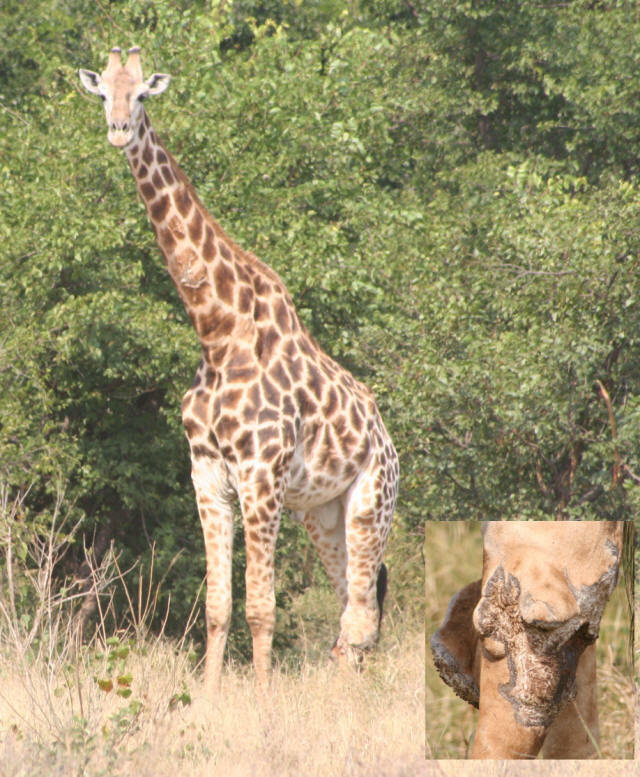 The Kanniedood drive is one of the best known in the whole Kruger Park. 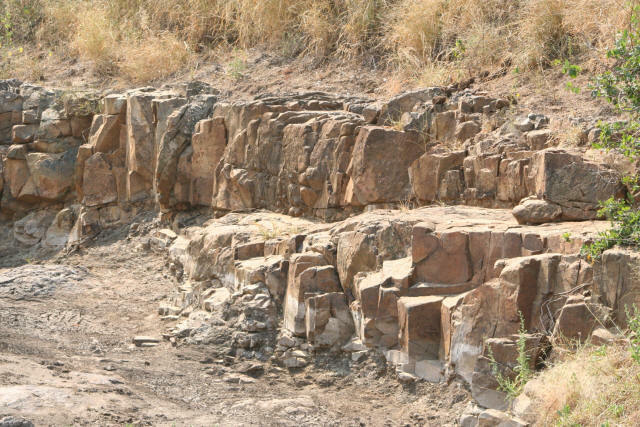 The Afrikaans word Kanniedood refers to a collection of a tree species called Commiphora and was named by Dr. U de V. Pienaar when the dam was built in 1975 because some of these tree and shrub species can be found in the area. The Kanniedood dam is a large one by Kruger standards. This first graph shows the short Mashagadzi loop that leads to waypoint 100, the Mashagadzi watering point before joining the main S50 along the Shinwedzi River to the point where it is dammed ... Kanniedood Dam. I got a shot of a beautiful Greater Blue-eared Starling in a Mopane bush on this drive. Take note of the shape of the Mopane leaf in the foreground and you'll easily see why it is compared to a butterfly. 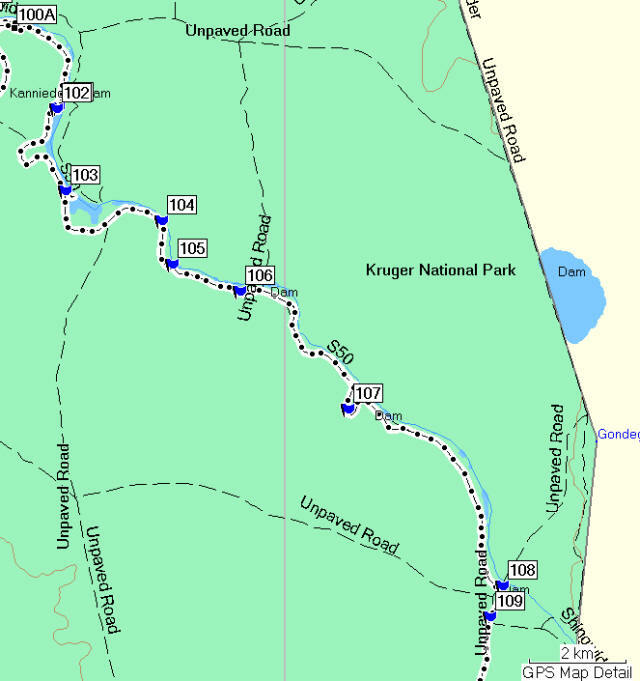 This map shows the various waypoints heading along the S50 in a southerly direction towards Kannieddood Dam. Time 10.30 and 27 degrees. I took the turn off to the Mshagadzi borehole (waypoint 100) close to the stream of the same name which I reached after startling a large elephant ... it is amazing how difficult it can be to see elephants despite their enormous size. This is especially true when driving alone as I was (not always easy to see both sides and ahead). 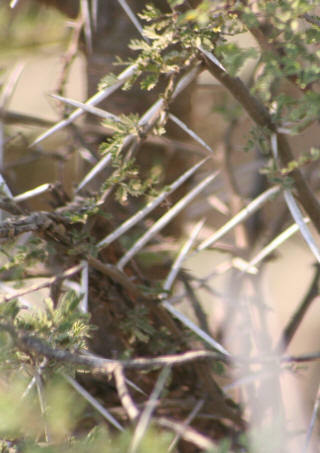 The surrounding vegetation here was mainly Acacia thorn species. The thorns you can see in the picture are about 4 inches long. At waypoint 101/100A I turned south towards Kanniedood along an enticing sandy road running along the edge of the Shingwedzi River. Shortly after joining the S50 heading towards Kanniedood Dam I parked in a small way by to enjoy a leisurely view of the river and switched off my engine. I had been stopped about a minute and I heard one of the loudest noises I have ever experienced. Not only was the trumpeting noise loud it sounded distinctly threatening and it came from a big elephant which was out of sight but obviously close by. The noise came from over my left shoulder. Read about this incident and also how stupid some people can be. Waypoint 101 (hidden maybe beneath 102 on the map because they were so close together) is the Kanniedood Bird Hide where you are allowed to get out of your but only to climb the stairs into the bird hide. I always feel a sense of insecurity when I get out of my car even in these spots and I always have a good look around before opening the car door. If lions were really intelligent they would wait close to the bird hide and seize one tourist a day ... thankfully they are not normally man eaters and do not have strategic plans in place. 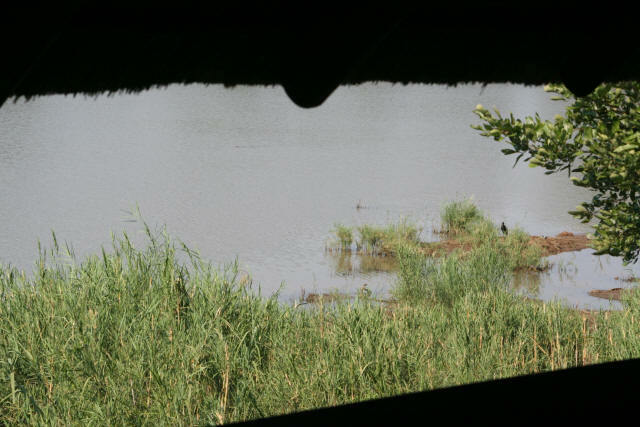 The bird hide is a wonderfully quiet and well constructed place where if you so choose you can spend hours in complete solitude overlooking the Kanniedood Dam which is only about 100 metres wide at this point. Although you will not be able to see in the photo there is a crocodile swimming from right to left just to the left of centre. There were also a pair of Blacksmith Plovers (Blacksmith Lapwing) and an Open-Billed Stork (African Openbill) together with an Egyptian Goose just below the hide completely oblivious to my presence. Waypoint 102 ... Butterflies Galore. As I left the bird hide I soon just had to stop when I saw a whole host of butterflies in one small spot. There were at least 7 species of butterflies enjoying the fruits of a small white flowered Jasmine type shrub. 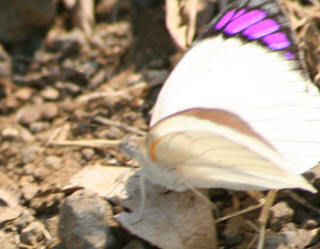 There were white butterflies with vivid lilac coloured edges to the wings, yellow with vivid orange wing tips, white ones with black patterned wing tips, small blackish butterflies and a particularly handsome brown with large yellow spots specimen that seemed to move from flower to flower very very quickly and even while it was settled its wings did not seem to stop fluttering at an enormous rate. On closer inspection it seemed to have 2 sets of wings ... one set closer to the head and it was these that never stopped fluttering while another set did remain stationery for a short time on alighting to display a marvelous yellow 'V' on a brown spotted back. Waypoint 103 is the turn off to see the wall of the Kanniedood Dam itself. The drive is about 300 metres to this view point. Waypoint 104 marks a point where there is an excellent view of riverside mud cliffs which show how high the river can rise and what power it can have to carve those steep cliffs. This type of cliff becomes and excellent nesting place for bee eaters that nest in holes in the banks in large colonies although I didn't see any here. Shortly after I came across some magnificent rock structures in both shape and colour. These formed the banks of a dry river bed once more indicating how water can rush down these channeled areas with awesome flash-flood force and fury. 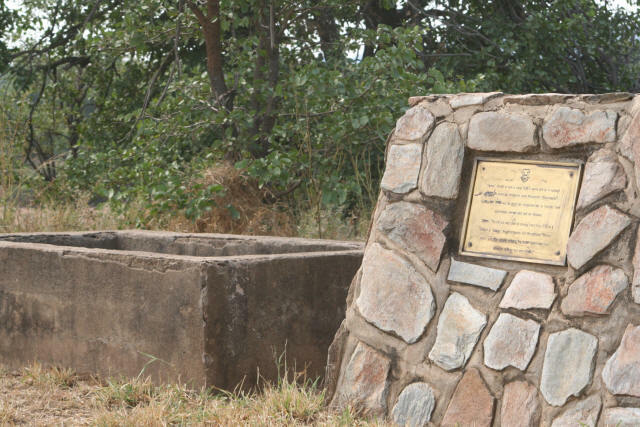 Waypoint 109 (about 16 kms from Shingwedzi) marked an interesting historical site with a plaque. The site consisted of a concrete bath called the "Dipeni dipping point." It was built in 1938 and was an outpost. It was used as a place to disinfect infiltrates from Mozambique where an outbreak of Foot and Mouth had occurred in1938. 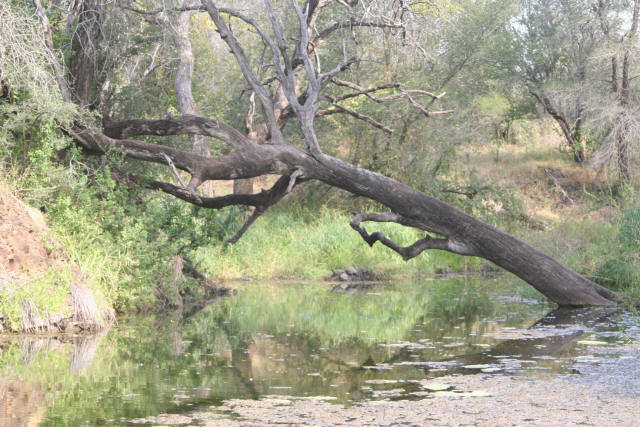 Dipeni is a Tsonga word meaning "at the dip tank." There was a footpath at this point. This point marked the end of a most interesting and worthwhile drive. I was about to start a long drive along the eastern border of the Kruger National Park ... Mozambique is of course on the other side of the border.